Make your bathroom turn heads with our stylish freestanding taps. These taps add a touch of luxury to any setting be it modern or traditional. Available in a choice of styles and designs to complement any space, why not consider a stunning freestanding bath tap or high rise basin tap for your dream bathroom. When you think of freestanding taps it is easy to imagine only traditional styles. We do have lots of classical options for you to choose from, however we also stock lots of contemporary twists on this timeless style to suit modern freestanding baths and basins. 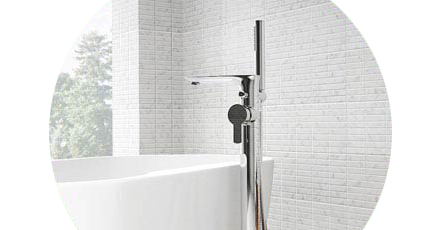 Our freestanding taps come in different models, suitable for basins or baths. Freestanding bath taps, also known as floor standing taps, perfectly complement freestanding baths and create a truly elegant feel. Freestanding basin taps, frequently referred to as high rise taps, partner wonderfully with countertop basins and are commonly found in stylish modern bathrooms.